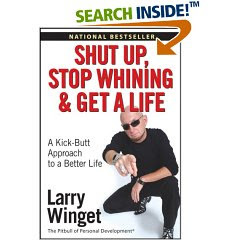 Shut Up, Stop Whining & Get a Life provides a number of interesting lessons and insights into personal development for your staff. Rick is available to lead a small team discussion - excellent for small business teams looking to energize their personal development. Receive a free pdf of Rick's complete analysis - put Shut Up, Stop Whining & Get a Life in the subject line. Very interesting book from the author who considers himself the pitbull of personal development. The book is written in a confrontational style in an attempt to get the reader to think. A continual theme throughout the book is that the truth hurts - it's tough - we all know what we should do, but it requires effort or takes us out of our comfort zone - however, if we follow that path we will move towards our true purpose in life. Success is achieved through service and taking on personal responsibility. * stop talking and listen - really listen to others - listen to family and build relationships - listen to your customers as they'll tell you how to succeed and serve them well - listen to experts and ask for their help - listen to great music that relaxes and inspires - listen to your higher self, your conscience, God. * don't listen to people who talk bad about others, office gossip, others who talk down to you for any reason at any time, or yourself when you're talking down / negative self-talk. * stop whining - take responsibility for yourself, your actions, your life - example for me: people are fat because they eat too much. period. overeating and no exercise is my fault and not the food services business ie - McDonald's, etc. * stuff happens - it's what makes life interesting - take responsibility, clean your mess, fix your problem, commit to do better. * whining prolongs the problem - cannot focus on fixing the problem when whining - make a plan instead - a plan energizes your actions - focused on the solution - that's when life moves forward. * you are always able to still do more - are you willing? - the world is made up of the wills and the will nots - be a will! * your life is the way it is because you have not been willing to do what it takes to make it different. Rick has further analysis on personal attitude, personal belief system, enjoying your life, education, stress, relaxation, finances, relationships and more. Receive a free pdf of Rick's complete analysis - put Shut Up, Stop Whining, & Get a Life in the subject line.